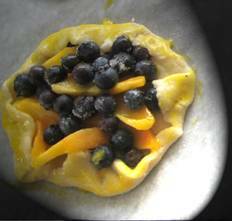 When I was in cooking school, we made a lot of tarts, such as fruit tarts with fresh berries, and savory tarts with asparagus and other vegetables. The presentation of the tarts was also very important. We didn’t just put a pastry shell in and fill it. There had to be some planning to make it look fabulous at a party or dinner. One of the savory tarts that I have really enjoyed is an asparagus tart made in a 14 x 4-inch tart pan. This is a beautiful tart when removed from the rectangular pan and put on a long platter, and served with a salad with vinaigrette for a light supper. And place the crust to fit into a 14 x 4-inch tart pan, and partially blind bake the crust. Set aside to cool. Preheat the oven to 350°. Set the tart shell on a baking sheet for easy handling. gently until tender-crisp and brightly colored, 1-2 minutes. Remove from the heat and cool slightly. Arrange the asparagus spears crosswise and top to tail in the tart shell. Beat the half and half, eggs and egg yolk until well blended. Season with salt and cayenne pepper, then stir in the dill or chives and mustard. Pour into the tart shell. Bake until set and golden, about 25 minutes. Transfer to a wire rack to cool slightly. Serve hot or warm. When we made the fruit tarts at Le Cordon Bleu, we never mixed the fruit, but instead put the fruit in sections. Thaw the dough and place the cookie dough in a 9-inch tart shell. Cut off any excess dough from the edges. Or make Pâte Brisée from the recipe below. Put foil or parchment paper in the shell and then fill the shell with rice or dried beans. Bake for 10 minutes in a 375° preheated oven. Remove the paper and bean or rice and prick the shell all over with a fork. Bake for another 8 to 10 minutes or until the shell has browned. Set aside to cool. Melt the raspberry jam in a small saucepan or the microwave. Place the raspberry jam on the bottom of the cooled tart shell. Fill the shell with fruit. Place the fruit on top of the raspberry jam. Melt the apricot jam and brush it on the fruit. Refrigerate any un-served tart. Preheat oven to 425°. Place flour and butter in a food processor. Process on the “on” and “off” for about 8 times. Combine the salt, sugar, lemon juice, egg yolk and water in a small bowl. Turn on processor and add the liquid down the processor tube. Process until dough forms a ball. Chill the dough for 1 hour. Roll the dough to 1/8-inch thickness on a floured surface. Fit into a 9-inch tart pan. Place parchment paper or wax paper inside the shell. Fill with beans or rice. Bake for 8 minutes. Reduce the oven temperature to 375°. Remove the parchment along with the filler. Place tart shell back in the oven and bake until golden brown. Remove from the oven and cool before using.